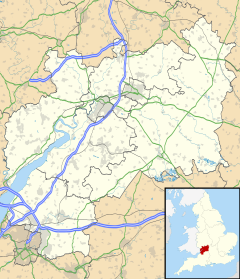 Thornbury is a market town and civil parish in South Gloucestershire district of the county of Gloucestershire, England, about 12 miles (19 km) north of Bristol. It had a population of 12,063 at the 2011 Census. Thornbury is a Britain in Bloom award-winning town, with its own competition, Thornbury in Bloom. Nearby villages include Morton and Thornbury Park. The civil parish includes the hamlet of Milbury Heath. There is evidence of human activity in the Thornbury area in the Neolithic and Bronze Ages, but evidence of the Roman presence is limited to the Thornbury hoard, of 11,460 Roman coins dating from AD 260–348, found in 2004 during the digging for a fishpond. The earliest documentary evidence of a village at "Thornbyrig" dates from the end of the 9th century. Domesday Book noted a manor of "Turneberie" belonging to William the Conqueror's consort, Matilda of Flanders, with 104 residents. St Mary's Church, begun in the 12th century with later additions, is the oldest surviving building. The town charter was granted in 1252 by Richard de Clare, Earl of Gloucester and lord of the manor of Thornbury. The charter's 750th anniversary in 2002 was celebrated with a "750" flowerbed planted in Grovesend Road. The town grew around the site of its cattle market. Thornbury lost its status as a borough in 19th-century local government reforms, but in 1974 the parish council exercised its new right to designate itself a town council. The ancient parish covered a large area extending to the River Severn, and included the detached area of Rangeworthy until 1866, when this became a separate civil parish. In 1894 the western part was detached to form the civil parish of Oldbury-on-Severn and the eastern part to create that of Falfield. Thornbury Township, Pennsylvania, USA, founded in 1687, was named after Thornbury, Gloucestershire, by George Pearce, whose wife Ann came from there. In 1765 Dr John Fewster of Thornbury presented a paper to the Medical Society of London entitled "Cow Pox and its Ability to Prevent Smallpox". Fewster was a big influence on his friend and colleague Edward Jenner, the pioneer of vaccination. Thornbury was once the terminus of a Midland Railway (later LMS) branch line from Yate on the Bristol to Gloucester main line, with intermediate stations at Iron Acton and Tytherington. It lost its passenger services in June 1944 but continued as a goods route, also serving quarries at Tytherington. The site of Thornbury railway station and the line have been redeveloped into a supermarket, a housing estate, a bypass road and a long footpath. Further relics of the line can be seen at Tytherington Quarry to the east of the town. There are plans to reopen the line to Yate via Tytherington and Iron Acton and possibly restore services to Gloucester and Bristol. Thornbury had a market held in the high street and the market hall. It closed in the late 1990s, being partly replaced by a smaller market in a car park near the United Reformed Church. The older site has been redeveloped as a community centre called "Turnberrie's"; the older community centre, at the Chantry in Castle Street remains in active use. The old market hall is now a clothes shop. Thornbury's coat of arms combines the arms of four families important to its history: Attwells, Howard, Clare and Stafford. John Attwells bequeathed £499.99for the establishment of a free school that merged with the grammar school in 1879. The Attwells arms was later adopted as the badge for the grammar school. The other three families held the manor at Thornbury over several centuries, with the Latin motto Decus Sabrinae Vallis (Jewel of the Severn Vale). Thornbury has been successively part of the following parliamentary constituencies: Thornbury (1885–1950); Stroud and Thornbury (1950–1955); Gloucestershire South (1955–1983); Northavon (1983–2010); and Thornbury and Yate (2010–present). The current member of Parliament is Luke Hall of the Conservative Party. Thornbury High Street. On the left is the old market hall (now commercial premises), the White Lion pub and a Tudor style house. Thornbury has a high street, a shopping centre (St Mary's Centre), two supermarkets and many smaller shops. The town has seven places of worship: St Mary's Church, Christ the King Catholic Church, the Methodist Church, the United Reformed Church, St Paul's Church, and the Hackett and Thornbury Baptist churches. On the outskirts at Lower Morton stands an independent evangelical church, Morton Baptist Church. The many pubs in the town include the White Lion in the high street, which won the Thornbury in Bloom award in 2003 and the Britain in Bloom award for Best Pub Display in 1999. Restaurants include one at Thornbury Castle, also Ronnie's of Thornbury, and the Indian restaurant Romy's Kitchen, with Romy Gill as chef and owner. The shop front of the Wildings (formerly Worthington's) clothing shop was used in the Two Ronnies serial sketch, "The Worm That Turned". The nearby nuclear power station at Oldbury-on-Severn, Tytherington quarry and Stokefield Close were all used as locations for the 1976 four-part Doctor Who serial The Hand of Fear. The Castle School, Thornbury was used for an episode of Casualty broadcast on 2 May 2009. Thornbury has its own radio station, which returned in July 2017 after a five-year break. North Avon Youth Theatre (NYTC) perform an annual show at the Armstrong Hall in April. Octopus Thornbury is a drama group which produces a summer show in June each year, a charity show in October and pantomime in January. rehearses and performs in Christ the King Church Hall. Octopus was conceived in 1971 as a multi-denominational society which would bring people of the Thornbury area together for a range of social activities – the tentacles of the octopus. Of these tentacles only the drama group remains but this has exceeded all expectations. Thornbury Area Music Trust (TAMT), a charitable music trust, runs musical groups for children aged 4–18. On Saturday mornings the Thornbury Area Music Centre and Junior Music Centre meet at Marlwood School. They perform regularly at other local venues. The South Cotswold Youth Orchestra (SCYO) is for musicians of Grade 5 standard and above. It performs at least one concert per term in the area, and provides an opportunity for the best musicians in South Gloucestershire, North Bristol and the southern area of Gloucestershire to play symphonic music. One of the biggest firms on the industrial estate in the south of the town is Essilor, who manufactures spectacle lenses. The construction of the Midland Way has boosted industry by allowing traffic to avoid the steep and narrow B4061 road. The B4061 loops off the A38 at Alveston, passes through the centre of the town, and rejoins the A38 at Whitfield, thus forming the main routes into the town from the north and south. Gillingstool and Grovesend Road form an easterly link from the centre to the A38. The High Street is on the very edge of the town to the west. The Plain is at the north end of the High Street, notable for the pump in the middle of the road. Castle Street heads north from the Plain to Thornbury Castle and St Mary's Church; it passes several older buildings including 'the Chantry' which is now used by the community association (TDCA). Midland Way and Morton Way are modern additions forming a roughly semi-circular eastern boundary to the town, and allow HGVs headed for the industrial estate to avoid the centre. A tourist information centre operates from the Town Hall in the High Street, weekdays 9am to 5pm. One of town's notable features is its castle, a Tudor structure begun in 1511 as a home for Edward Stafford, 3rd Duke of Buckingham. The two intricate redbrick chimneys, built in 1514, resemble those found at Hampton Court Palace. Cardinal Wolsey had the Duke beheaded for treason in 1521, after which the castle was confiscated by King Henry VIII, who himself stayed there for ten days in 1535 with Anne Boleyn. 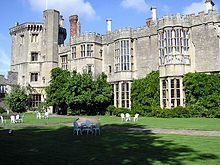 Thornbury Castle fell into disrepair after the English Civil War, but was renovated in 1824 by the Howard Family. It now serves as a 27-room luxury hotel and restaurant. Construction of the Anglican Church of Saint Mary the Virgin started in 1340, with major additions in 1500, 1848 and 1988. It remains in use for regular worship, baptisms, confirmations, marriages, funerals and remembrance services. It also hosts the local primary school (St Mary's CEVA Primary) for their seasonal celebrations, such as Harvest, Christmas and Easter. The church is the resting place, according to his will, of the entrails of Jasper Tudor, uncle and mentor to the young Henry Tudor, later Henry VII of England. The rest of his remains were buried in Keynsham Abbey, Somerset, but the buildings did not survive the Dissolution of the Monasteries under Jasper's great-nephew Henry VIII of England, so that the church here has his only remains. The town pump on a small island at the bottom of the High Street shows a hand pointing "To Gloucester". The original pump was removed in 1924 as a road hazard by the council. The new one built in 1984 was temporarily painted gold to celebrate the Golden Jubilee in 2002. It is usually adorned with flowers and birthday greetings. A footpath called 'Streamside Walk' starts at Gillingstool Primary School, passes over several roads and bridges, continues past Thornbury Hospital and Manorbrook Primary School, and on to the north of Thornbury, where the stream leaves the town. Another stream runs through the north east of Thornbury and merges at an old mill. Although the station building has been demolished, the old railway line serves as a footpath. It was laid out in the 1990s to support new housing and industrial developments, previously having been grassed over and neglected. Starting from the industrial estates it follows the route of the streets of Streamleaze and Avon Way, ending near a roundabout at the top of Avon Way. Created by the Thornbury and District Heritage Trust as a Millennium project, the 'heritage trail' encompasses the town's historic buildings. There are forty way-markers indicating the route, which starts outside the town hall. Mundy Playing Fields were donated to Thornbury by Mrs Violet Mundy in 1937. They feature a children's play area and sports ground. Nearby are Thornbury Golf Club, Thornbury Leisure Centre, Thornbury Lawn Tennis Club and a skate park. In south Thornbury there is a small children's play area. There are green spaces around the town. A Thornbury community garden was set up near Gillingstool School, but has closed due to housing development. A replacement community garden will be installed next to the new Community Centre. Thornbury RFC play in the South West 1 League. Despite being a Thornbury club, their ground is located in Rockhampton, on the outskirts of the town. Thornbury Town FC is Thornbury's main football club, providing football for children from six years old up to open age, with its First Team and Reserves. The exact formation date is uncertain, but football was being played in the town in 1896 and that there was a Thornbury Town Club in 1898. The youth section was formed in 1990 as a separate club (Thornbury Falcons). In 2010 the two clubs merged as a new Thornbury Town FC. The First Team play in the Gloucestershire County League, which is tier 11 in the English football league. They won their first league title in the 2009–10 season and a second in 2017–18. The First Team play at the Mundy Playing Fields, with their youth teams playing in various locations around Thornbury. In 2016, an area of land adjacent to the Mundy Playing Fields, known as Poulterbrook, was converted into two purpose-built youth football pitches, as well as allotments for the local community. Real Thornbury FC plays in the Bristol Premier Combination Premier One, which is tier 13 in the English football league. It was established in 2007 and became an FA-affiliated team in 2009 in the Bristol and District League. It has gained promotion each season, with back-to-back league titles from 2010–11 to 2013–14. In the 2013–14 Bristol and District Division 2 season the team won all 26 games, with a goal difference of plus 143, and was granted promotion to the Bristol and District Senior Division, skipping Division 1. It went on to beat Hambrook on the final day of the 2014–15 season to secure promotion to the Bristol Premier Combination League as runners up. Real Thornbury FC play at Oaklands Park in Almondsbury, which has been home to several clubs, including Winterbourne United and Almondsbury Town both of which have since dissolved. These include Filnore Woods, Armstrong and Cossham Halls and Thornbury Museum. A heritage trail offers information signs about places of interest, starting from the town hall (once the police station and magistrates' court) and now home to the Town Council. The MacLaine Memorial Fountain is dedicated to the memory of Lieutenant Hector MacLaine, a local man who helped protect the British in India from the Russians and Afghans in 1880. Thornbury has an antiquarian mathematics bookshop. Thornbury is twinned with Bockenem in Germany. Gillingstool Primary School dates back to 1862, and is known for its school bell. The school was rebuilt in a project that began in spring 2009. The Victorian era buildings are being retained and will continue in their present use as a Sure Start Children's Centre. Other schools include St Mary's Church of England Primary School (founded in 1839), which recently celebrated its 175th anniversary with a series of spectacular events, including a Victorian Week, where the children dressed up in period dress and planted daffodils to commemorate the event. Crossways Infant and Junior schools, Christ the King Roman Catholic Primary School, Manorbrook Primary School, New Siblands Special School and the Sheiling School (an independent special school part of the Camphill Movement). John Attwells's Free School existed in the 19th century. A plaque about it can be seen on a shop in St Mary's Shopping Centre. Beverley Robinson (1723–1792), American loyalist, died in Thornbury. William Holwell (1726–1798), classicist and lexicographer, was presented to the vicarage by Christ Church, Oxford in January 1762. John Rolph (1793–1870), Canadian politician, was born in Thornbury. George (1794–1875), Canadian politician, was born in Thornbury. Handel Cossham (1824–1890), politician, was born in Thornbury. E. M. Grace (1841–1911), international and county cricketer, later played for Thornbury Cricket Club. W. N. Hodgson (1893–1916), war poet, was born in Thornbury. R. W. G. Dennis (1910–2003), mycologist and plant pathologist, was born in Thornbury and attended the grammar school. Tony Britton (born 1924), actor, attended the grammar school. Sarah Singleton (born 1966), novelist and children's writer, was born in Thornbury. John Robins (born 1982), comedian, grew up in Thornbury. Emily Webley-Smith (born 1984), tennis player, was born in Thornbury. Matthew Kane (actor) (born 1991), actor, lived and grew up in Thornbury. Mako Vunipola (born 1991), rugby player, lived in Thornbury and attended The Castle School. ^ Vision of Britain website. ^ Smith, George, History of Delaware County, PA, Delaware County Institute of Science, 1862. ^ Nicolau Barquet and Pere Domingo. "Smallpox: The Triumph over the Most Terrible of the Ministers of Death". Annals of Internal Medicine. Retrieved 4 May 2009. ^ "Twin town gets birthday gifts". Gazetteseries.co.uk. 9 July 2004. ^ "SCHOOL HISTORY". thornburygrammar.co.uk. Retrieved 12 April 2019. ^ Gillingstool Primary School Newsletter Extra[permanent dead link] 6 June 2008. Wikimedia Commons has media related to Thornbury, Gloucestershire.